Sophomore infielder Tyler Hix throws a pitch during a baseball game against Rhode Island Sunday. 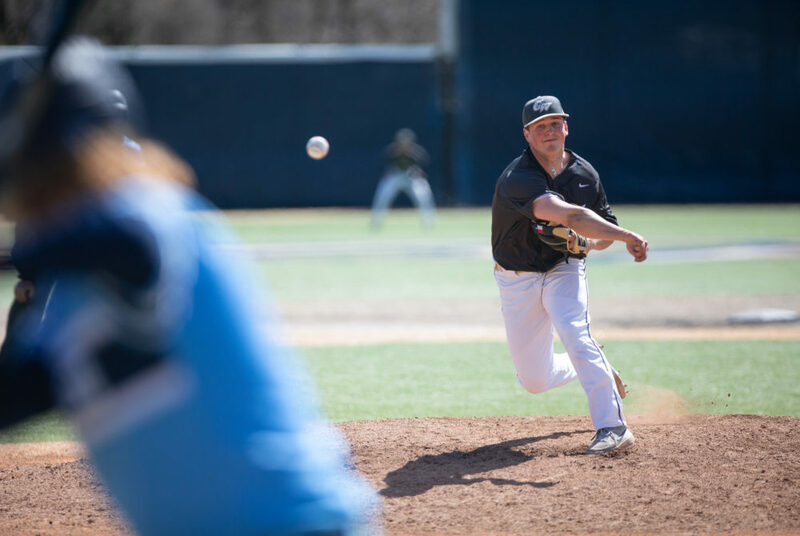 In its first series of conference play, baseball (14–9, 1–2 A-10) fell flat on offense and dropped two of its three home contests to Rhode Island (6–12, 2–1 A-10) over the weekend. The Colonials managed to score just six runs all weekend as their lineup, with just three returning regulars, learned to adjust to the heightened intensity of Atlantic 10 play. GW also struggled against the Rams on the mound, giving up a combined 28 runs across three games. Baseball suffered its most lopsided loss of the year in a 19–1 defeat to open the series. With senior right-handed pitcher Nate Woods out with an injury since early March, the Colonials are still not at full health on the mound. Junior right-handed pitcher Elliott Raimo started for GW and gave up three earned runs, two walks and two strikeouts in 2.1 innings of work. Four more pitchers took the mound after Raimo, but the Colonials could find no one to stop the bleeding. The team’s pitching woes, combined with a shaky defense – committing a season-high four errors in the game – and no offensive support proved lethal for the Colonials. GW’s lone run came in the bottom of the eighth inning when freshman catcher Anthony Frechette singled up the middle to start the inning and advanced to third when freshman outfielder Cade Fergus knocked a double to the gap in left field. Frechette scored on a groundout from Barmakian, breaking up the shutout and putting GW on the board down 15–1. “There’s a lot of stuff that we need to keep on top of as a team and just going forward we need to be a little better at,” junior infielder Nate Fassnacht said. The Colonials reversed their fortune in game two Saturday, defeating the Rams 4–3. GW cashed in four runs off eight hits and committed no errors, providing offensive and defensive support for redshirt senior right-handed pitcher Brady Renner. Renner threw five innings and allowed four hits, two runs and one walk. The Rams took a 2–1 lead in the top of the fourth off a solo shot by redshirt sophomore outfielder Max Mircovich before a two-run knock by freshman utility player Noah Levin put the Colonials back in front. Fergus solidified GW’s lead with a home run to left field in the bottom of the fifth inning to put the Colonials up 4–2 to round out the contest. GW’s bats went cold in a 6–1 loss Sunday against Rhode Island. Junior right-handed pitcher Jaret Edwards entered the weekend with a spotless 4–0 record but labored through 2 2/3 innings while uncorking 50 pitches. He exited in the third inning having given up four runs on six hits as the Colonials fell behind 4–0 early. Redshirt freshman right-handed pitcher Justin Cherry worked with pinpoint efficiency for the Rams all afternoon, keeping GW hitters off balance with a heavy mix of off-speed pitches. Cherry had the Colonials swinging early in counts and threw just 50 pitches entering the seventh inning. The Rams put up runs in each of the first three innings, and Edwards gave way to senior southpaw Pat Knight. After four outs and a clean fourth inning, junior right-handed pitcher Andrew Wheeler shut down the Rams’ hitters in the fifth and sixth innings. Despite Knight’s and Wheeler’s efforts to preserve the four-run deficit, GW’s bats had no answers against Cherry. Wheeler ran out of steam in the seventh inning and sophomore right-handed pitcher Kevin Sylvestri came on after back-to-back singles had Wheeler in a jam. Sylvestri induced a double play with the bases loaded to erase two Rhode Island runners, but a hard-hit Rhode Island ground-ball single to centerfield delivered the knockout punch and put GW behind 6–0. Junior right-handed pitcher Keagan McGinnis and sophomore infielder Tyler Hix held the Rams scoreless in the eighth and ninth innings, but the Colonials could only muster one run on offense when Barmakian delivered a sacrifice fly in the bottom of the eighth inning. The Colonials return to action hosting UMBC at Tucker Field Tuesday. First pitch is slated for 3 p.m.